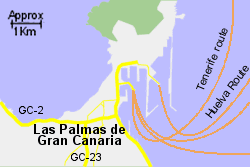 Map of the Las Palmas Port area. 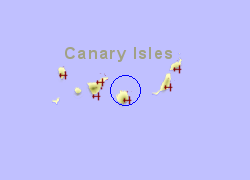 The port at Las Palmas de Gran Canaria lies against the old city of Las Palmas and is sheltered from the west and the north by a promontory on the north coast of the island. 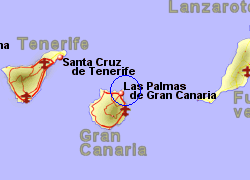 Las Palmas airport is approximately 22km from the port. 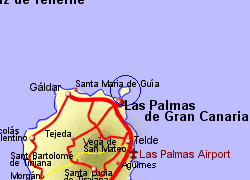 Being the capital city, Las Palmas has good road connections - the GC-1 takes you to Maspalomas on the southern tip of the island in 45 minutes by car (a distance of 55Km). Bus services are available from the port area. Operated by Acciona with 1 crossing per week, crossing time 45 hrs. Operated by Armas with 1 crossing per week, crossing time 31 hrs. Operated by Acciona with upto 1 crossing per week, crossing time 4 hrs. Also operated by Armas with up to 3 crossings per week, crossing time 2.5hrs. Operated by Acciona with upto 1 crossing per week, crossing time 19 hrs. Also operated by Armas with up to 7 crossings per week, crossing time 14.5hrs. Operated by Armas up to 1 crossing per week, crossing time 3hrs. Also operated by Fred Olsen with up to 3 crossings per week, crossing time 2hrs. Operated by Acciona with up to 5 crossings per week, crossing time 7.5 hrs. Also operated by Fred Olsen with 1 crossing per week, crossing time 4hrs. Also operated by Armas with 5 crossings per week, crossing time 7.5 hrs.